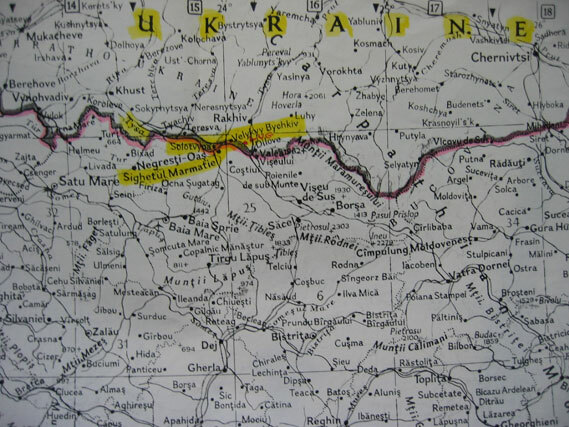 Medium view map showing the borders of Romania and The Ukraine.You can also see the Tisza River outlined in black/red.The yellowed area shows where the majority of the Kratz Family resided prior to World War 2 Spring 1944. 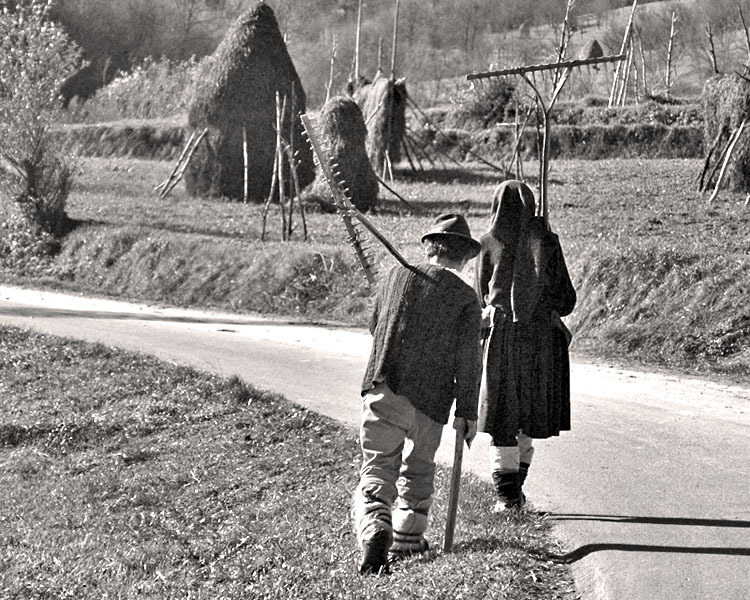 Many rural settlements were laid out such as this:There would be a main street which divided the village and on either side were the old style wooden houses with thatched roofs.Most of the Jews lived near the main street and most lived in the thatch roof houses.Only the richest citizens could afford to have a stone house.Most of these villages did not have automobiles,electricity,telephones,etc.This was a very rural region.Jews became involved in many trades like Artisans,shoemakers,Butchers,Porters,Carpenters,Loggers,Farmers,etc.Some Jews owned businesses like General Stores,Drug Stores,Taverns,etc,Nearly every Jewish family had a vegetable patch by the home and maybe even a cow,chickens,or even geese.Jewish people in this region were very religious and usually the first building to go up in the community was the "Mikvah" (Religious Bath House) and the Synagogue.The dress was mostly Orthodox Chasidic.On the Sabbath the men wore a shtreimel (fur tail hat) and a kapsta (long black coat).The women wore long clothing skirts to the ankles and hair tied in with a head kerchief. In the communities early days all observed the Commandments,the men all wore beards and the payas (long sideburns) but after World War 1 there was a Conservative movement that modernized some of the Jews way of thinking.Most children went to a Cheder which is usually a one rooom Jewish School.There they would learn to read and write Hebrew,learn the Bible,and learn the way of being Jewish.Classes were befroe and after the regular Public Schools and all children walked to and from both schools even in the bitter winter.The teachers barely made a living and the community all donated to a teacher for their payment.No child was turned away from the Cheder.Later on the child might be sent to a Yeshiva which is a higher Jewish Learning Institution.Most Jews donated food and money for the upkeep of the Yeshiva.Some of the Jews learned to speak Ruthenian,Czech,Hungraian,Romanian,Yiddush,and German.These Jews could help with the running of the whole Jewish community in their village. Most of the poor Jews made by on corn bread during the week but on Thursday they would get the yeast dough to make Challah Bread for the Sabbath.Families were very close so all helped with the weekly Sabbath preparations.Pious Jews distributed Challah to any of the poor who could not afford to buy their own.There was no cooking on the Sabbath so all food must be prepared before it came on friday night. When the Sabbath came the house was filled with light,the clothes were all washed and pressed,and family were all togehter.They chanted and sang traditional songs.They went to a sabbath celebration "Bata" where the community met and they would tell stories of famous Rabbis,sing,and dance.On the high Holidays some Jews might travel very far by horseback to see and hear a famous Rabbi they admired. On the last day of Passover was "Simchat Torah" and there would be a great Celebration with many Jews gathering and dancing down the streets and sealing off a portion of a road for a big street party.There would be important toats with the Jews drinking wine and hard liquor and soon it would come to the 6TH toast which was "To He Who Helps The Poverty Stricken".Many commmunities gave this toast to the pious young men who gave so much of themselves and this was a great honor to those young men who helped with the poor.Also on this last day the people gathered in front of the Rabbi's home (Chevra-Kadisha For the Care Of The Dead) since on this day the dead were memoralized by "Yitzkor".On these Holidays which were very festive the ending prayers came late at night as no one wished the festivities to end. It appears that many Jews of Marmaros didnot wish to emigrate and lose their traditional ways.following world War 1 this view did change and so some of the Jews did emigrate to U.S.A.,Palestine,some to Baron Hirsch's Argentine Settlement.I also know Jews ended up in other countries as we have many family who live in Canada.They had emigrated around the 1920's. One might wonder about the organizational structure of the Jewish community.Well here is how it was in many places.These small communities fell under the jurisdiction of the Orthodox Bureau which followed the rulings of the great Rabbis of 1868 after the Orthodox had split from the other Jewish Religious Factions.The leadership was made up of Orthodox members who were elected by a secret ballot.Communal takxes didnot exist and every married resident had a right to vote.They usually elected a head,assistant,and more trustees.The Orthodox Bureau was called in settle any disputes of a religious nature.The income of the community came partailly from the ritual slaughter fee a butcher paid,a tax on kosher meat,and a tax on the yeast dough for Challah.In most towns there was a burial society,grave diggers group,Talmud Study,Mishna Study,good deeds workers,and a group who visited and helped the sick.There were men and women always willing to help out their neighbors. In Marmaros very few people made a big Bar Mitzva or Bat Mitzvah party when their child turned the age of 13.On this day they would bring a honey cake and some liqour to the synagogue and no gifts were given out.Weddings on the other hand were very festive occasions which would last days.Even the poorest would hold a festive party.Beddings,Pillows,Blankets,Sheets,Towels,and some other household items were given by the parents but mostly this obligation lay with the bride's parents.Only the few wealthy Jews could afford to give a gold watch or expensive jewlry.In order to prepare for the wedding the neighboring girls held a "feather plucking" party called a "klakeh" and they would serve french fries,sing,and entertain each other as they plucked the feathers needed to make pillows and bedding.For the weddings of the rich they came by invitation or because of one's relationship with the family.The day of the wedding two girls dressed in their best clothes would go from house to house saying "The bride invites you to the wedding".If the bride parents was poor or she was an orphan the girls of the village would all get together and help the one to be married.The "Badchan" would come to where the girl sat and sing songs of wisdowm and moral teachings.If the bride was an orphan he would sing sorrowful songs and she might burst into tears.Afterwards the "Badchan" went to the groom's home where he would sing songs of moral teachings and praise the union of the two people.The honor of performing the service went to the Rabbi,The Dayan, or other scholar familiar with the Laws of Marriage and Divorce.